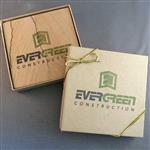 Absorbent stone coaster set - a great automotive gift. Drive in new business with the help of this stylish set! 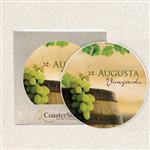 This absorbent stone car coaster set in clamshell packaging is made of natural absorbent stone and features a finger notch ensuring easy removal. It keeps cup holders clean and dry! 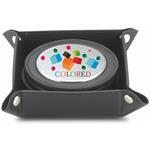 Customize with your company, event or society logo to create a gift ideal for generating maximum brand recognition. 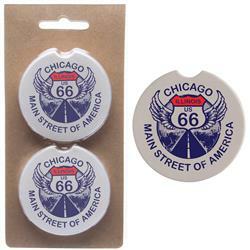 Distribute to potential customers during upcoming tradeshows, conventions, conferences and so much more! Includes 2-coasters. Dimensions: • Coaster: 2 9/16" Dia. x 1/4"
• Packaging: 3 7/16" x 7 1/8"
Typical Imprint Area(s): 2 3/8" Dia. Available Imprint Options: Color Print. Full color available with run charge - inquire.